Reinbek bei Hamburg: Rowohlt, 1991. This is the Rowohlt edition of People of Darkness (1980), the fourth novel in Hillerman's Navajo Mystery series and the first to introduce Sergeant Jim Chee of the Navajo Tribal Police. 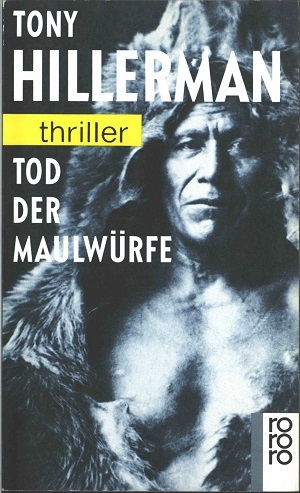 The title translates as "death of the moles," while the cover exhibits a black-and-white photograph of a man wearing a bear skin over his head and back, which would be taboo in Navajo culture. The text was translated into German by Klaus Fröba. Format: Paperback, 19 x 11.5 cm.